4. Have a blast challenging other people with your quiz! AirConsole.com is an online entertainment system which turns your smartphone into a controller and your screen into the console. 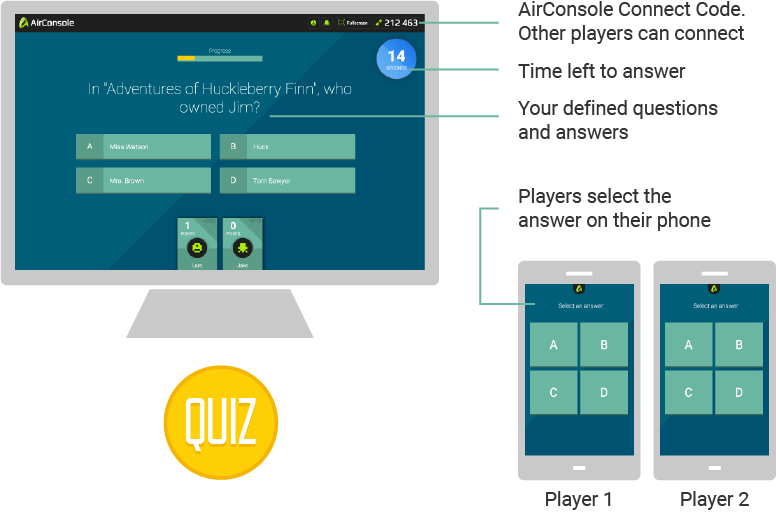 The AirConsole Quiz Game runs on your screen - your smartphones are used to select an answer. Why not make a personal quiz about one of your best friends? Ask personal questions which guests have to answer. Let's see who knows your friend best! For teachers or students, make a quiz to prepare for your next test. Who knows your favorite actor, soccer club or musician the best? Dedicate a quiz entirely about one of your favorite heros. Make a fun facts quiz about your company or colleagues. Who talks the most in a meeting?